1. Dani had asked why we weren't going through Lake Pontchartrain. I had no real answer other than it was out of the way… We were kind of fitting in stops for weather windows and it just wasn’t on our list. 2. During dinner Dani started to say something about a bridge but Tate told her that we had already passed that way to get here... What was she going to say? I spent the morning trying to mentally adjust. Top it off with a West Marine delivery promised to us that did not happen, and the Lake being socked in with a dense fog… We were delayed again! I was snippy! Bruce, fearful of causing some kind of unpleasant event, cautiously broached the subject of yet another change… There’s a place across Lake Pontchartrain called Mandeville, he told me. There is a free dock there with electricity and water. We could sail across the lake. Well, since he prefaced his proposal so as not to cause my head to spin around… I considered it. OK, lets do it. We hopped on the boat (I had been hanging out at the marina office using the wi-fi) and headed towards the lake. We got the autopilot calibrated and it WORKS! Clouds parted angels sing! Bruce raised the mainsail, then rolled out the jib. Engine off and whats this? We’re still moving! With no engine! How could this be!? It’s been so long since we’ve sailed this boat, we forgot what it’s like! I waved goodbye to New Orleans and to the demon inside my head. We were both grinning and it just felt so good. It is indescribable. No narrow banks, no barge traffic, no worries. 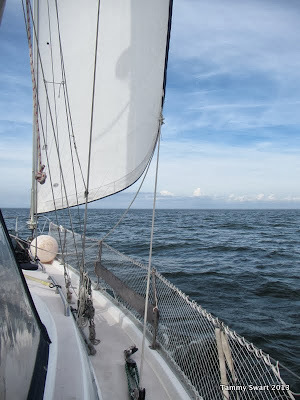 The winds were perfect just aft of our Port beam. The water was no problem, no chop just a gentle procession of small waves. Jetsam came out and even Jezabelle joined us in the cockpit for a while. There was no seasickness! Another miracle! 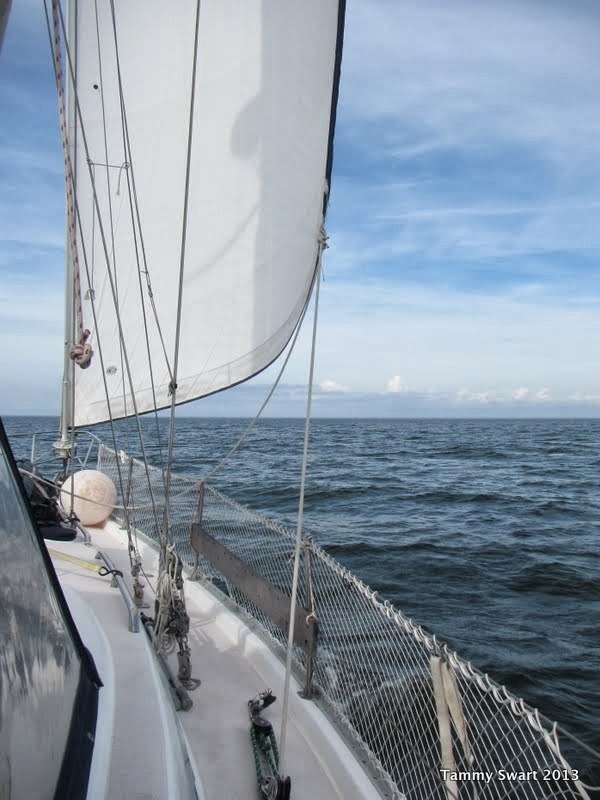 We were sorry to see the winds die and our boat speed drop to the point we were forced to drop sails and start the engine once again if we hoped to make it to our destination by dark. With the threat of fog, we reluctantly gave up sailing once again and motored the remaining 3.5 miles to Mandeville. We arrived as the sun was low but we could still see the marvelous fall colors and green trees dotting this quaint town’s waterfront. We slipped inside the breakwater and brought the boat to a gentle stop alongside the transient wall. We even had some help with the lines from a couple of fellows already docked here. The difference in my attitude at that moment from that of the morning, could not have been more opposite. The highs and the lows… that’s what Cruising is all about. I still have to remind myself that it’s OK to change the plan, go with the flow, do something spontaneous. But my other self says that I need to plan and prepare and study and have everything lined out… How will I ever reconcile the two? Time will tell… but with a few more sailing days like today… I know I’ll be alright. Bruce continually tweaked the sails... who are we racing? It's amazing how often the motor needs to be restarted to finish a Lake crossing.